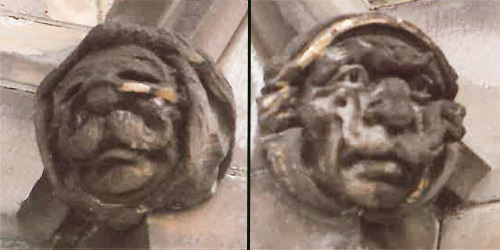 The anti-German and anti-Kaiser sentiment that was prevalent in Canada during the First World War can be found on a wall carving on Canada’s Parliament Building in Ottawa — depicting a Kaiser Wilhelm II and a German spy. West wall Vimy memorial on the Parliament Building. 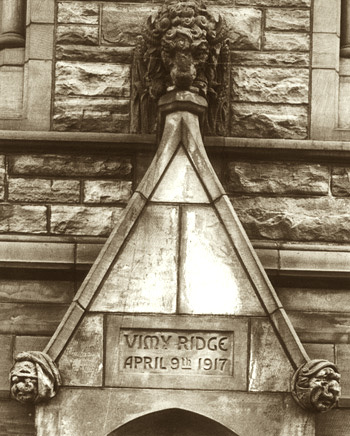 In the April-May 2011 issue of Canada’s History, we included the following letter from Thomas Ritchie of Ottawa, which also included the following photos of the sculptures on Parliament Building. “The cartoon in Charles Hou’s article “Lampooning Laurier” (Laugh lines December 2010–January 2011) exemplifies the anti-German and anti-Kaiser sentiment prevalent in Canada during the First World War, sentiment that led to a new name for at least one community (Berlin became Kitchener). Another example — a wall carving on Canada’s Parliament Building in Ottawa — depicts Kaiser Wilhelm II and a German spy. Left: Masked German spy. Right: The Kaiser.